Bo Huhn, the spokesman for the Connecticut chapter of Smart Approaches to Marijuana, speaks at a press conference Wednesday. The debate over whether Connecticut should legalize recreational marijuana got heated at the State Capitol Wednesday as advocates opposing legalization held a press conference that was repeatedly interrupted by heckling pot supporters. “I believe we really do need to understand the impact that this could have on the state, on our kids, on our families,” said Bo Huhn, spokesman for the Connecticut chapter of Smart Approaches to Marijuana. Huhn said the state needs to be aware of the risks associated with marijuana use before it moves forward with legalization. Huhn stood in the packed room among law enforcement officials, medical professionals, Guilford High School students, local clergy, and lawmakers who took turns detailing their opposition to the latest iteration of a legalization bill that failed to pass in previous legislative sessions. The advocates argued the bill would lead to increased use of the drug by teens, act as a gateway drug, and pose neurological risks for youth who try marijuana. Advocates for legalization are banking on support from the Democratic majority in both legislative chambers and newly-elected Gov. Ned Lamont to shepherd the bill into law. Members of the Connecticut affiliate for the National Organization for the Reform of Marijuana Laws (NORML) held up reams of statistics showing declined marijuana use among teens in states with legalization and interrupted speakers several times during the press conference. Deputy Minority Leader Vincent J. Candelora of North Branford said it behooves the legislature to support more studies examining the impact of recreational legalization in other states. Candelora said the recreational legalization would also effectively do away with the state’s medical marijuana industry. “When I first started looking at this issue I was not necessarily adamantly against legalization, but as time has gone on and as research has come forward, I have become more and more adamant that as a nation this is a mistake in what we’re doing,” Candelora said. Along with the marijuana legalization bill introduced by the Progressive Caucus, a variety of other measures have been proposed this legislative session. Those proposals include requiring the inclusion of medical marijuana in Connecticut’s prescription drug monitoring fund, conducting a study to determine the best way to detect if someone’s driving is impaired by pot use, and creating a fund for school districts to use toward testing vaping devices for tetrahydrocannabinol. 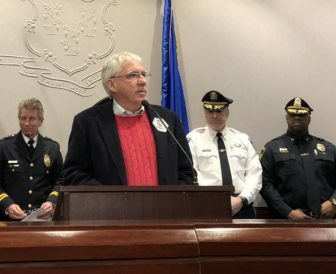 Connecticut Police Chiefs Association President Jim Cetran said legalizing recreational marijuana would require heavy policing by law enforcement officials who are already overwhelmed with the opioid crisis. He said police officers do not have the resources to deal with marijuana enforcement, selling, regulation or revenue issues. Brian Essenter, a public outreach coordinator with Connecticut NORML, said he expects a lot of debate on the issue and warned the measure could fail if state lawmakers are not educated enough. “I think now the legislators are seeing it as a pressing matter, it’s getting a lot more momentum and many of them are much more open to being educated and I think if we can do that properly, it has a good chance to pass,” Essenter said.